Indian ink on heavyweight drawing paper. Sheet size 16.6 x 23.2 cm. Size of the drawing approximately 10.5 x 12 cm. 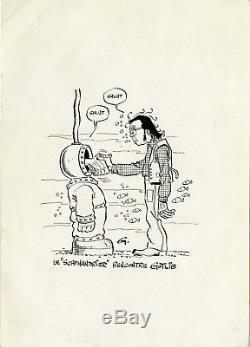 Drawing made to illustrate an interview with gotlib in a fanzine, the diver, who will not see the light of day. The item "gotlib original drawing unpublished circa 1974 the diver meets gotlib" is on sale since Saturday, December 8, 2018. It is in the category "books, comics, magazines \ bd \ boards, original drawings". The seller is "pireu" and is located in / in paris. This item can not be delivered, the buyer must pick it up.